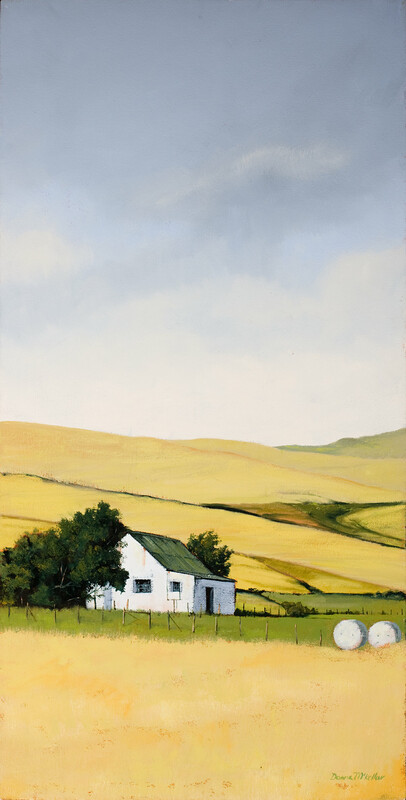 This painting depicts the golden fields of wheat and canola in the Overberg area, where the wheat is rolled into huge cylinders of food for the animals during the harsh winter months. Riviersonderend is a village in the Overberg region of the Western Cape, South Africa, about 140 kilometres (87 mi) east of Cape Town. It is located on a loop of the Sonderend River, from which it takes its name. In the census of 2011 it was recorded as having a population of 5,245. The N2 national road passes through Riviersonderend, forming its main street; it is 161 kilometres (100 mi) by road from central Cape Town.